Position: the First Vector | THERMO Spoken Here! "Where is ..." something is a question each of us has asked another person at some time or other. Suppose the person asked knows "where the some­thing is." The "something" might be car keys, the next freeway exit, the rest room, etc. For the "asked" to inform the "asker" where the "something is" requires both persons to have adequate familiarity with the surrounding space - from where they are to where "it is." The space the something "is in" must be mutually known. The location of "the something," in the mutually known space being known only by the person asked. More specifically, the space in question must have some manner of mutual beginning point, a reference, a geographic position of mutual knowledge. For example, in a city, the two might know where the "court house" is. Technically a commonly known location might be called an "origin." Also reference directions relative to that point must be mutually understood. North, East... avenues or streets, directions must be understood by both parties. For two people familiar with the streets of a city; such knowledge is common. So staying with our "city" analogy of space, let's choose the courthouse as a common point. Next imagine a Cartesian coordinate system with its origin located at the courthouse. Let our imagination construct axes, X and Y (aligned in the Earth plane) and in accord with whatever symmetry exists; let Z designate the vertical. That done, we have the least idea of a coordinate system. To use this coordinate system to state a position, we specify a vector that extends from the origin to that position. In general that position (relative to the origin and the axes) will be partly "left, behind to the right and up (or down)." We must define a vector basis for the space. All of this constitutes establishment of what is called a "well-defined vector space." To be quantitative, science must have a precise, mathematical description of space. Vectors are easier to learn and to use than to discuss. In every example, every detail of definition of vectors and their use will be explained. Vectors and the Vector Triangle: The figure shows a triangular shape in an "implicit" manner. No angles, coordinates of points, etc, are specified. Suppose the shape were to represent an actual piece of land with small stones (point masses) located at 0, A and B. The positions of the points and their relation each to the others can be written "implicitly" in terms of directed line segments, i.e., vectors. Implicit Vectors An implicit vector representation of the triangular area results when "arrow heads" are applied to the previous figure. By adding an arrowhead to one end, of a line segment, one changes the segment into a vector magnitude (length of the segment) and direction. To this point the vectors we have discussed were implicit meaning clearly stated but not yet quantitative. Vector equations are created implicitly, double-checked then changed to explicit form to be solved. It is easier to learn about physical vectors in focused, physical contexts. And, although space vectors are three dimensional, often at two-dimensional coordinate space will suffice. Learning is not harmed and an economy of vector arithmetic is obtained. Explicit Vectors Engineering is quantitative. Next we make our triangular figure more specific by specification of numerical values and insertion of a unit vector basis. The above equations show simply the implicit vector OA is explicitly written as 9I. 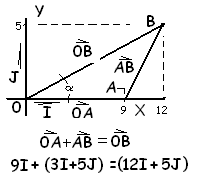 Also the implicit vector, 0B, has an explicit representation in component form as, (12I + 5J). This being a two-dimensional space, a basis and two numbers are needed to specify a vector. Alternately if the vector is not known, two numbers are not known. Often it is convenient to write a vector in a second way, in a "magnitude-direction" form. Thus the length of vector, |OB| is "13" units. To determine the direction of vector OB we multiply it by 13/13, then move the "13" of the denominator to the right, beneath each of the component numbers. A final point is the quotients, 12/13 and 5/13, respectively are the cosine and sine of the angle α which equals 22.6°. 0B can be written using that angle. So these are some of the representation styles of vectors. With use, the advantages of one style or the other are learned. This simple operation shows that scalar multiplication of two vectors produces a scalar which equals the magnitude of one vector times the magnitude of the other, times the cosine of the smaller angle between them. Were it the case that the vectors were perpendicular, the cosine of 90° would equal zero, hence the scalar product is zero. As illustrated above, vector equations relating positions of points in space are easily written. And, once written, they are easily checked. Vector equations, written correctly, express the geometry of any physical situation, any event, in a powerful, orderly manner.